Reduced solvent use in coatings, causing longer cure times. 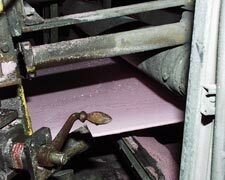 Increased use of aqueous based coatings and washes. Use of more environmentally friendly paints and coatings that do not dry as quickly. Increased awareness of the cost of compressed air for dry-off. The many disadvantages of compressed air for dry-off. A demand for increased label information including point of production bar codes and date stamps. Increased production line speeds, reducing drying time available. Turbotech air knife solutions combine the best design and advanced flow technology, achieving efficiencies exceeding 98%.